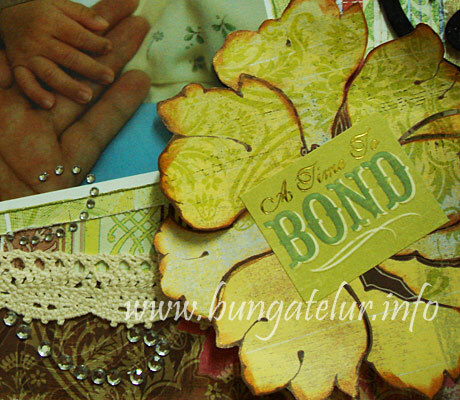 I found about this challenge at City Crafter Challenge Blog while blog hopping to other scrapbookers’ blog. I thought well, this frame I made about a few days ago should fulfill the requirement as it has flowers and lace. The initial plan was to do decoupage on the wood frame which has been painted a few months earlier. But after I finish painting it I realized that I don’t have napkin/serviette that suits the color of the background. Since I have so many old stash of Prima paper flowers, I decided to layer them on top of one another like what I’ve seen in a scrapbook magazine. Some combination does look good while others I have to keep aside for other craft I will make in the future. The edge of the flowers have been inked with chalk ink. I used Prima self adhesive crystals in the middle of the flowers. For the sentiment, I used sticker by K & Co. The lace is from Making Memories Vintage Hip Trims Gracen line. To ensure that the bottom left flower does not stick to the glass frame, I glued it to a piece of square sticker since I don’t have any transparency sheet. 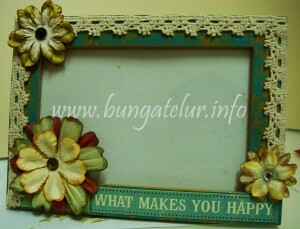 I am happy that finally this green turquoise frame is decorated nicely. I put a picture of our son in it and give it to Hubby so that he can put it on his desk at work. 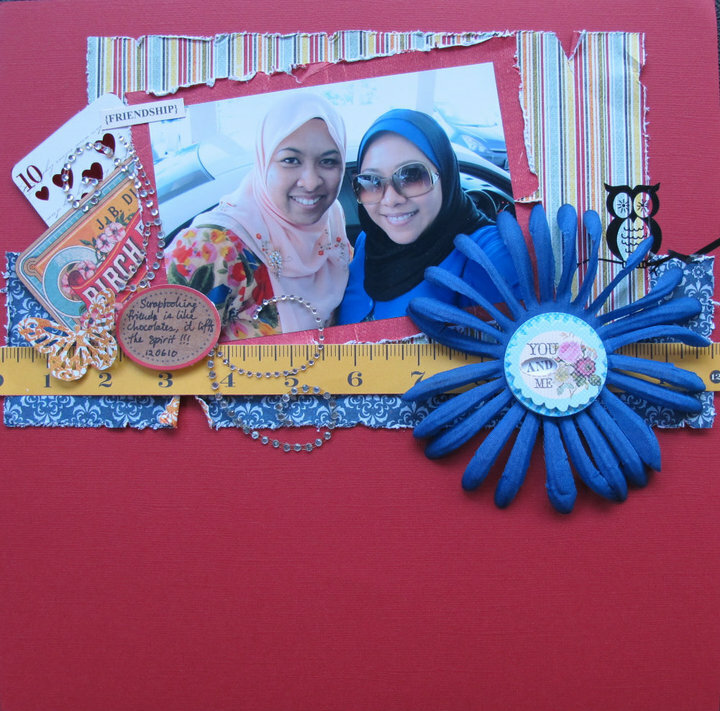 After checking most of DT’s LO I decided to scraplift Naddy’s LO. I noticed that she used layering technique for her simple LO and distressed most of the papers. Since I just bought Tim Holtz paper distresser from Papier on Sunday, I decided this is the kind of LO I should try for this challenge. I used patterned paper from Basic Grey Urban Couture (retired) which I have bought like 4 years ago. I was looking for paper that has something yellow and green, the same color as my son’s blanket. Luckily Poplin suits the criteria. The stripy paper where I glued the photo on is Ratine. The photo was matted on Gabardine. Guess I was trying to used as much as patterned papers in the Urban Couture series for this layout..hehe! For the embellishment, instead of using the usual stash of the Prima flowers, I decided to cut out those two flower pattern from one of the papers (I think it’s Lux) and used them for the right and left side of the picture. I inked the edge of the flower using DewDrop chalk ink in Rust and quilled them a bit, just to make it stick out once pasted on the layout. I used sticker Roam Family Togetherness by K&Co as those words – Remember and A Time To Bond reflects the sentiments that I feel while looking at the picture. I also used the Kaisercraft rhinestones which were bought a few months ago. And thanks to the Tombow Mono Aqua Liquid Glue which was also bought at Papier, the whole glueing process, be it under the lace (using Making Memories Vintage Hip Trim), and layers of papers was a breeze. Perhaps I could do more layout in the future since I kind of have proper tools to speed up the scrapbooking process..heh! Next time I want to use either my handmade crochet flower or rose made using grunge paper as part of the LO’s embellishment. Can’t wait for the next challenge to enter..hehe! Rummaging through the old stash of scrapbooking stuffs I have for so many years, I decided to make this bookmark to give to a friend. I don’t have many choice of cardstock. It wouldn’t be nice to have a flimsy, soft bookmark. The only cardstock I have which is good enough to be turned to a bookmark is the 6×6 pad from Making Memories Gracen. 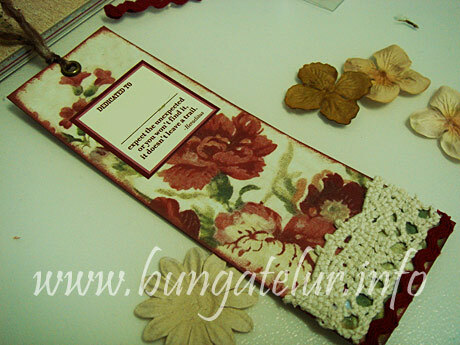 I used the Flower and Red cardstock for this bookmark. Since I don’t have a clear stamp with sentiment that is suitable, I decided to use one of the stickers from 7Gypsies line. The thank you card below was made for a crafter friend who has been so kind to me. She borrowed a tatting book from the National Library (even renewed it for another 3 weeks) and posted it to me so that I could learn how to tat. Since I needed to post the book back to her, I made this card to say how thankful I am for her good deed. The card was made by folding the 6×6 cardstock in Stripe pattern in half. I stamped the sentiment using the newly bought clear stamp by Basic Grey. I used the maroon ric rac from Making Memories Vintage Hip Trims – Gracen as embellishment. I also put two crystals from Prima. Somehow I feel that their adhesive is not strong enough, it keeps on sticking on the plastic packaging instead on the back of the gemstones when I take out the pearl/crystal to use…very annoying for me. The paper where I stamped the sentiment is from My Mind’s Eye Wild Asparagus line. I am yet to use most of the patterned papers in my stash even though I’ve bought them since 2006..huhu! I hope I will be able to make more cards and bookmarks in the future so that I could buy new collection of papers without feeling too guilty for not using them..haha! All these 3 hair clips were no longer in my possession. I gave them away to family and friend as Hari Raya gift. I made them a few weeks ago in the attempt to try all sort of patterns and different type of thread and yarn I bought earlier. The pink yarn was bought in Subang Parade for about RM30 per skein. Expensive, huh? If only I live somewhere where yarns are available in massive choices and not that expensive. It would be nicer if I could buy a few different tones of pink yarns. 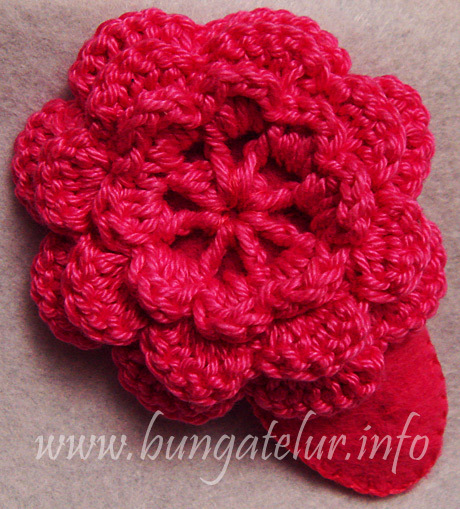 I could crochet the second and third layer of the flower with different shades of pink instead of one tone. I tried using pink felt as the hair clip cover. 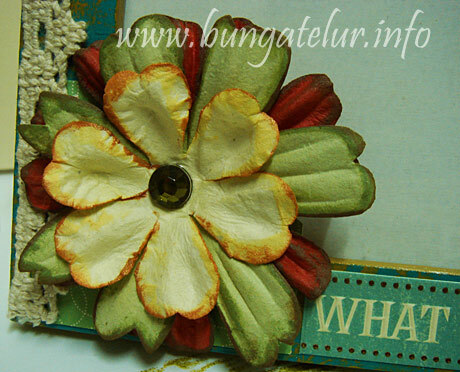 The result looks monotonous since the cover is the same tone as the flower..huhu! Then I found a pattern for butterfly. This time I made the hair clip cover in black felt so that whoever wears this will look as if she has a big butterfly fluttering on her hair since the black felt will blend in with her black hair. However I sew the butterfly wrongly. The antenna of the butterfly should be facing downward so that when you put the clip on your hair, the butterfly will be facing up. Lesson learned! 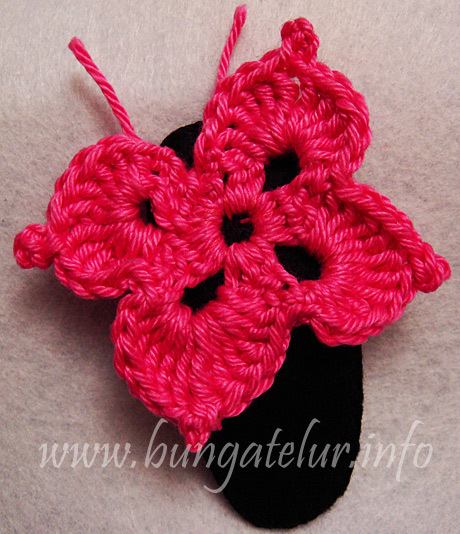 For this flower pattern, I used embroidery thread like the one people use for cross stitch. It was quite hard to crochet since the thread is very fine compared to the usual yarn I use for crochet. 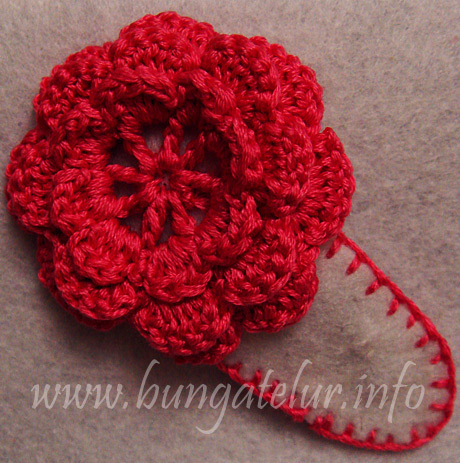 I will not be using those kind of floss to make crochet flower anytime soon..heh!